No poem last week as I was on vacation. 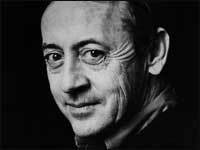 This week’s poem by Billy Collins is light and accessible. Collins is a rare poet: charismatic, attention-loving and even funny. He has appeared numerous times on NPR. I saw him read in San Francisco a few years back and the crowd (of maybe 300?!) treated him like a rock star. He’s quite the poetry celebrity. You’ve probably never heard of him though, which says a lot about poetry celebrity. Collins' work is clear, clever, and often moving. You’ll notice that there isn’t much complexity to his style, and I wouldn’t consider his work to be musical, but I think it’s enjoyable. And he’s found a way to appeal to a wider audience, something few poets have been able to achieve lately. A friend of mine once pointed out (exasperated) that he writes all of his poems in his house, usually in his bathrobe. This is true. But he has an active imagination. Billy Collins has a fascination with mice. They show up in an astounding number of his poems.